Attention Vegans and Vegetarians: Are you having trouble figuring out what to make for dinner tonight? As a vegan, you don’t eat any animal products – no milk, cheese, eggs or meat. So when you are trying to figure out what’s for dinner, you can’t just zap a microwave meal or rely on mainstream fast food joints to get you out of a jam. Vegan Success includes only our most tried and true, select recipes that actually work. These recipes don’t require 17 different steps and two days of cooking. They are uncomplicated, unpretentious, and are easy enough for every day. 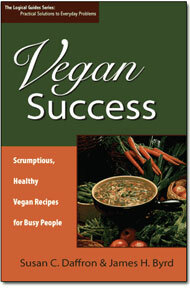 Vegans, vegetarians, non-vegetarians, cooks and non-cooks have all enjoyed the recipes in Vegan Success. Check out what our readers and the press have said about the cookbook. You just “went vegan” and now that you’ve realized what you can’t eat, you’re wondering what you still CAN eat. As a new vegan, you are mystified by all the weird ingredients you find in other recipes. Every recipe you look at involves weird ingredients you don’t have and can’t find at your local grocery store (“What the heck is a kohlrabi?!) Maybe you’ve wondered if the cookbook authors even were vegan. We are and know how you feel! You’re stuck in a rut, making the same food over and over (“If it’s Tuesday, it must be time for a baked potato”). A few new recipe ideas might just unleash your cooking creativity again! You think chopping all those vegetables could take forever (“Wow, that’s a really big zuchinni!”) Learn how you can make luscious dinners in record time. What if you could create mouthwatering vegan dishes every night? The type of real food that is great for your body and good for your soul. …Vegan Stuffed Potatoes. In this luscious recipe, baked potatoes are married with vegan cream cheese, baby spinach, tomatoes, and just four spices to create a creamy medley of flavors. …Pasta with Spicy Sesame Vegetables. In this dish, the subtle scent of sesame oil mixed with garlic floats through the air as you spear your first piece of ziti with your fork. The tahini in the sauce lends a creaminess that coats the sugar snap peas, tofu and other vegetables with flavor. Neither of these recipes is difficult. And they are both in Vegan Success: Scrumptious Healthy Vegan Recipes for Busy People. Check out a PDF file that contains the table of contents and the first chapter (511K). The table of contents lets you see the complete list of the recipes in the book (because it’s a PDF file, you need the free Acrobat Reader to view it). Vegan Success is chock full of a whole bunch of delicious, hearty, satisfying, melt-in-your-mouth good vegan recipes that don’t take all day to make, and don’t leave you hungry an hour later! If you’re hungry and want to eat now, this is the book for you! Order from Amazon.com if you read a lot. If you buy other books at the same time, you almost always can save money on shipping by taking advantage of Amazon’s Super Saver shipping offer.